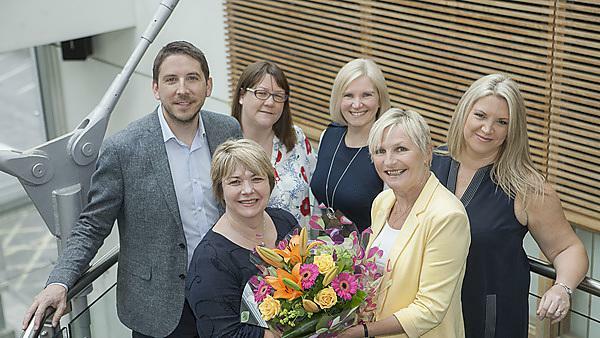 A team of oral health experts from Plymouth University Peninsula School of Dentistry and the Peninsula Dental Social Enterprise (PDSE) have been honoured for their work in the local community as part of National Smile Month. Campaign organisers, the Oral Health Foundation, decided to award the team with the award due to the tireless work they have done within the local community, in particular their amazing work with adults with learning disabilities as part of their pioneering dental ambassador scheme – the first of its kind in the UK. “National Smile Month may have now come to an end but we wanted to make one final special announcement; to a team that takes the messages around the campaign and uses it every day throughout the year. We were impressed by the team’s commitment to the pioneering dental ambassador scheme in Plymouth, which offers people with learning disabilities the understanding, awareness and confidence to encourage their peers to adopt better oral hygiene and make regular visits to the dentist." “They have truly encapsulated the key messaging and mood of National Smile Month by engaging with local groups in an interactive, effective and important way. At the Oral Health Foundation, we are constantly amazed by the incredible work groups up and down the country achieves every single day, during Smile Month and far beyond, and want to take this opportunity to thank everybody for helping to spread messages about good oral health." Through the dental ambassador scheme 11 adults with learning disabilities across two cohorts, who are part of Plymouth People First, completed the dental ambassador training programme and are now able to spread oral health awareness even further thanks to the support project developed by the Community Engagement Team at the PDSE.